that's what we're trying to do for the audience." 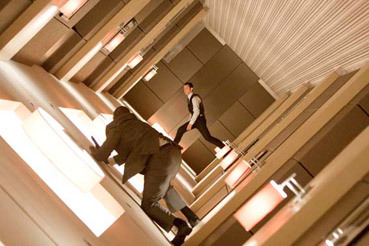 That is almost exactly the state I was in when I experienced Inception this afternoon. I'd seen the trailer (and was knocked out by the bending Parisian city streets) and was obviously 'up' for it having adored Nolan's Dark Knight as well as his earlier movies, in particular Memento. I knew the following – it was about dream states and DiCaprio was a dream stealer or something (see how vague that is?). Oh, and there was a still used on this very site that headed up the main page column above 'Reviews And Articles' – a still that echoed Fred Astaire's dance on the ceiling in Royal Wedding. Intrigued is the exact word. This is movie marketing by using nothing or very little as a worm on a hook. I swallowed and felt my tonsils pierced. You'd think that a company like Warner Brothers would want to keep its cards very far from its chest – you'd think it would want to sing from the roof tops: DiCaprio! Nolan (Dark Knight)! Uh... a plot that involves four levels of reality and none of them is The Matrix... Uh... How about a Japanese guy who hires DiCaprio to implant an idea in someone's head and have that someone act on it as if they believed it was their own... So the Japanese guy could do business less competitively (movie MacGuffins these days have such little substance). I came out of this movie and tried to explain the plot to my partner who promptly (albeit acting in a comedic fashion) fell asleep at my tortuous rehashed storytelling. Frankly, Inception is an effort but one very much worth one in return. To be blunt (and thankfully not James), this is a movie that would never have been made (or stood a chance of being made) without the billion dollar grossing director Nolan behind it and DiCaprio as a leading man. So in that respect, this is certainly a bit of a one off. If there is confusion, I will take the responsibility for that – but the movie doesn't make things easy. I cannot imagine for a mere moment that Nolan would have deliberately made a multi-million dollar film just to make audiences scratch their heads and yet... I cannot think of a film seen in my life during which both myself and my guest (my 13 year-old son) asked – at different times – "Do you know what's happening?" Now that may sound damning to the narrative in question but to have to ask that question (and have it asked in return) about a major Hollywood production simultaneously makes me weep and cheer. I weered and cheeped. The mere idea at having to work at a narrative constructed by an army of craftspeople over years and having cost a small fortune is startlingly refreshing if a little daunting. I'm all for working for my own entertainment but after the relative bad guy/good guy moral exactitude of The Dark Knight, one doesn't expect Christopher Nolan to confound everyone by delivering a reality shifting narrative that truly makes you think and – dare I day it – expects you to think. I thought. And I thought that the fact we don't know what the exact goals of the protagonists are is a major hic-cough to understanding what we are looking at. And the rules were being made up on the spot. Look, to understand the pain of a knife in the gut we must be aware of one of two things; how it actually feels and how we think it may actually feel. But we are in dreams, ladies and gentlemen. So Nolan decides that a lifetime can be lived in a dream state (fair enough) while hours pass in reality but it makes understanding the rules based on a cursory understanding of them difficult to follow. It's like cheering a football team when you don't know what the goal line signifies. But, given this rule breaking set up, I was still thrilled that I managed to care enough to see me through. This is either prescient film-making at its highest level or Nolan got lucky (as regards my own reaction which I'm sure he cares little about)! Inception is extraordinary. Is that enough? I would posit that there are a fair few Warner Brothers marketing folk who have very few nails left. How do you promote a film whose immense scale and size needs to be kept secret? Well, congrats to all concerned. I only found out it had opened this weekend by constant monitoring of our local cinema's listings and frankly was surprised such an enormous film slipped out like a fish from a KY jelly envelope. So what's the deal? Attempting to summarize Inception is like trying to measure spaghetti while eating it. If I had to be broad and unsubtle I'd say this (not giving anything away). The world of high corporate finance has recognised that one's subconscious is just as vulnerable to attack as a bricks and mortar bank. Using the right drugs, one could induce a dream state and 'invade' it using (I love this) a metaphor of the real world in which we all think we exist. So inside all of us are levels of reality created and recreated by our minds. The deeper you go, the more difficult it is to return. Now given the philosophical cliché that 'reality' is actually a dream state of its own (your reality is your brain's perception of 'reality') then the whole premise becomes moot. But let's say there were levels of reality our own brains created (each with Edith Piaf and Hans Zimmer pulsing through them) and they were vulnerable to attack. The idea of being able to plant an idea is an intriguing one. Ideas are viruses and to borrow an oft quoted suggestion from the movie which I've quoted many times elsewhere... DO NOT THINK OF AN ELEPHANT! So what are you thinking of? I have this idea that the sentence popularised by a section in Gödel, Escher and Bach by Douglas Hofstadter, namely "I am the thought you are thinking..." is a supremely powerful one. Here's a thing. Re-read that last paragraph of mine and do not wake up the next morning and think of an elephant. Pachiderms? You're doomed! See Inception with my blessing. It's a cool Hollywood action picture with an intellectual bent. If it even makes half as much box office as The Dark Knight, I will eat my hat (curiously made of crispy duck skin). The biggest criticism is a damning one. You do not leave the cinema extolling the movie's virtues to others. Word of mouth (or lack thereof) may well bury this Inception.